I realized that I never wrote any article on this blog about heat transfer and thermal analysis… such a shame not to write about such a fascinating topic! If you never really did heat transfer analysis or if you never really thought about it, you are missing something huge! 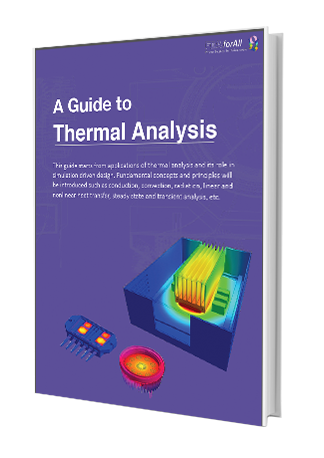 I will first tell you what the temperature actually means and where it comes from, then I’ll describe to you the 3 different types of heat transfer that exist in nature and finally, I’ll tell you how to do thermal analysis with FEA. If that sounds good to you, let’s start the ride! What does the temperature represent? The concept of temperature seems so obvious that we generally don’t even ask ourselves where it comes from. From where is this concept of temperature even coming from? Let’s take a close look at some water. If the molecules of water are well structured under a certain crystal form, they form a solid… in the case of water, those molecules form ice. Well, it happens that those molecules can be closer to one another… and loose from one another…and they can also vibrate. Temperature describes the vibration of the molecules. When the vibration of the molecules is very weak, they become immobilized and stay close to one another. Temperature is then very low. When the vibration increases, a certain movement becomes to be allowed and the water becomes liquid. When the vibration increases even more, the molecules detach from one another and water becomes a gas. What makes the temperature increase? Energy, of course! When you give some energy to the molecules, they vibrate more and the temperature increases. You can think about it like that, when you feed your body with food, you get your cells some energy, that’s why your body starts to generate heat and becomes hotter. When you don’t eat, you become cold. Now you understand what is temperature! Temperature is just a name to describe the state of vibration of the molecules. When we think about it at a conceptual level, heat transfer is just a name to describe the way molecules are transmitting their state of vibration to other molecules around them. When « Cold » molecules which are immobile enter in contact with vibrating « Hot » molecules, there is a transfer of energy between them. In simple words, immobile molecule will start to vibrate a little, while vibrating molecules will start to slow down. So, if every heat transfer can be described like that, why do we have different ways to transfer heat?? Because there is a difference due to the medium those molecules belongs to! Some molecules are in a liquid form (like water), while others may be inside a solid or a gas. Due to this difference of medium and physical form, scientists who have observed the transfer of heat between solids, liquids, and gas have determined certain laws based on their observations. How do we quantify the transfer of heat? Now, that we have the definition of temperature, we know how to quantify the vibration of molecules at a certain point. By the way, the temperature at which there is absolutely no vibration is called the absolute temperature in the Kelvin Scale. Temperature is an absolute value. How do we quantify the speed at which the temperature flows?? Well, for that, we just have to look at 2 theoretical points 1 and 2 at which we take the temperature. A temperature flow is as the name indicates it, a difference of temperature between 2 points divided by the distance between these 2 points. If this distance becomes infinitely small, this quotient becomes… a derivative. Ok, now that we know that, how do we apply it to engineering to predict the heat flow in various materials and media? There was a physicist called Fourier, who observed this heat flow in various materials and he was the first to observe something strange…. The only difference being the speed of heat transfer which is faster in some metals than others. Which basically states that the heat flowing through a surface inside a solid material is equal to the heat flow derivative, multiplied by a coefficient K, called the thermal conductivity. What it means is pretty straightforward… if K is higher, temperature propagates faster and if K is low. That’s why the metals which have a high value of K lose very quickly heat while isolate material with a very low K value prevents the heat to go through them. So, to predict the transfer of heat inside a solid, the only thing that you basically need is the coefficient K, which is a constant of the material that you are using. We understand easily that if air is not at a uniform temperature, things will become much more complex… so to simplify the whole mechanism, we suppose that the temperature of the air is uniform Ta, and we usually call that the « ambient » temperature. It basically states that the loss of heat of a body is proportional to the difference of heat between this body and the surrounding medium. In short, it means that if the wall is hotter than the air, it will lose heat until it reaches the ambient temperature of the air around it, then the difference of heat becomes null and there is no loss of heat anymore. As it is proportional, he invented another constant coefficient h which depends on the actual medium. This phenomenon is known as « Natural Convection » and the coefficient h is called the convection coefficient. You’ll note that this law of convection depends on the surface A of the wall… this is why when you do heat transfer analysis in your FEA Software, you need to specify the surface of the part you apply it to. What is the difference between natural convection and forced convection? It is called natural convection when the convection happens normally without the cooling being accelerated by a special device like a fan. It is called forced convection otherwise. The main difference is in the value of the h coefficient which is much higher in a case of forced convection. Ok… now let’s go for the third type of heat transfer…radiation. You know that in our physical world, we have 2 types of descriptions of nature, we have « particles » and we have « waves ». So… the energy we receive from a far and distant source, like the sun and propagated by photons of light is transmitted through electromagnetic waves. The only thing you need to understand here is that the electric field and magnetic field have the capacity to store and transmit energy. When the medium around the wave is the void, there is no energy loss, while when the wave enters a medium such as air or water, there is a loss of energy and transmission of that energy under the form of heat. That’s why a wave distant from 149,597,870,700 meters can impact us and make us warm all day. This heat transfer method is called « radiation ». I won’t give you here too many details because radiation is much more complex than conduction or convection. j* is basically the total energy radiated per unit surface area of a black body per unit time. Heat transfer which contains a radiation load in FEA is thus a nonlinear type of heat transfer. How to perform a heat transfer analysis in FEA?? Ok, finally something practical… I told you at the beginning that there would be some demo this time. I’ll do something very simple here. This will be a steady-state heat transfer, we won’t examine the transient state yet. For the first time on this blog, I’ll be using Ansys Academic edition to perform this simple analysis. The reason being that I just discovered that there was a free version for students available here. I really want to contribute and help engineers (and students) who are new to FEA to understand basic concepts better and faster! 1- Help me to share this article on Linkedin, facebook, twitter or in your habitual forum to help more people understand heat transfer. 2- Let me know in the comments what you learned from it and what you would like to learn even further so I can write more on the topic. 3- Join the newsletter and I’ll send you everything I write (and much more) by email! Nice article! But “Free” != “Libre.” It is a shame that students use free instead of libre. thanks for a useful topic..really interesting to refresh my basics again. Very good article, really need more in-depth analysis to make the subject “Heat Transfer” – a simple straight forward for understanding and application. thanks for this nice subject. You have covered key points to understand the subject, and the explanation was very clear. I hope you can keep on doing this outstanding articles! That is a fantastic article. Thank you for posting it and performing it in Ansys. I have done some basic heat transfer in Femap and Star CCM before but now that I am trying to expand my horizon in Ansys, your article helped a lot. Additionally, I would like to request you to please post an example related to non linear analysis(radiation). That would help a lot. I enjoy reading your articles.